Oops - we don't appear to have a video for the ScanSnap S510M (Mac). Although quite pricey, this is revolutionising my life and allowing me to become as paperless as I can in a very short space of time. I no longer keep layers of paper, but scan my notes and photos. So long as my hard drive doesn't fry then I'm OK. I bought from tradescanners and they were great, fast delivery, they also answered a number of questions prior to purchase. Highly recommended. Great scanner! Fast, reliable and perfect for turning paper into PDF's, has changed my life!!! 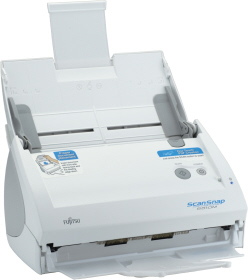 Built to be a performer, the Fujitsu ScanSnap S510M scanner digitizes both sides of a document in a single pass, in color, and at an amazing speed of up to 18 pages per minute (36 images per minute in duplex). With an auto document feeder capable of feeding 50 pages continuously, the S510M can scan through stacks of documents in no time flat! With a tiny footprint that takes up less space than a letter size piece of paper, users will never have to worry about where to place a ScanSnap S510M on a packed desk. Space efficiency and document feeding performance is further enhanced with the addition of a builtin stacker that conveniently folds over its angular design. Advanced Features for the Ultimate Ease of Use! The S510M distinguishes color documents from black & white ones and converts them into PDF files. The S510M recognizes the size of each page being scanned such as A4, B5, A5, B6, A6, Business Card, Legal and Letter. The S510M straightens images and shows them in their proper orientation. Auto blank page deletion - The S510M saves storage space and editing time by automatically deleting blank pages. Scan more with the Carrier Sheet - The ScanSnap S510M provides a Carrier Sheet to permit digitizing delicate documents as well as paper as large as A3. Intel® Mac® Compatible - The S510M is supported by Mac OS® X v10.4 Tiger and Intel® or IBM® PowerPC® based computers. Adobe® Acrobat® 8 Professional for Mac® Included - Adobe® Acrobat® 8 Professional software enables Mac users to reliably create, share and control authentic Adobe PDF documents for easy, more secure distribution. The Quick Menu sets a new standard in ease-of-use and control over scanned documents. Attach scans directly to email, save scans to selectable folders or send scans directly to a printer in place of a photocopier. With Quick Menu, ScanSnap S510M users get more out of their scanned data. Powered by the included ABBYY FineReader software, the ScanSnap S510M can automatically convert scanned data into searchable PDF files that support Mac OS spotlight and Adobe® Acrobat® searches.